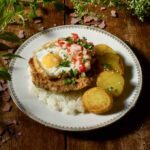 Silpancho is a traditional dish of Cochabamba (Bolivia), consisting of rice and potatoes, covered with a breaded steak topped with fried eggs. Mix the tomatoes and onions. Season with salt, pepper and vinegar and set aside. Place the whole potatoes in a large pot of cold water. Add salt and lemon juice and boil until cooked but still firm. Place in the refrigerator to cool them while preparing the rest of the recipe. In a large Dutch oven, heat the oil and fry the rice and garlic for 2 minutes over medium heat, stirring constantly. Add 3 cups of boiling water. Season with salt and pepper. Cook the rice for 10 to 12 minutes. While rice is cooking, prepare the steaks. Make 4 thin patties with the ground beef. Season the patties with salt, cumin and black pepper. Dredge the steaks in the flour on both sides, then pat them to remove the excess. Plunge the steaks into the beaten eggs and finally dip them in the breadcrumbs until they are evenly covered. Heat a large amount of cooking oil in a skillet. Fry the steaks over medium-high heat for about 2 minutes per side, until they are golden brown. Place the steaks on paper towel to remove excess oil and keep them warm. Take the potatoes out of the refrigerator and cut them into slices or cubes. Dip the potatoes and fry until golden brown. Place them on paper towels. Heat 4 tablespoons of cooking oil in a pan and fry the remaining 4 eggs. First, place a layer of hot rice over the entire surface of the plate. Add the sliced ​​potatoes on one side and steak on the other. Place an egg on top. Then garnish with the tomato and onion salad on top. To finish, sprinkle a little chopped parsley.